Open from 11:15 am on weekdays och and from 5:00pm on Saturday. Open Tuesday – Friday from 4pm. Saturday and Sunday from 12am also serving lunch. Sankt Eriksplan 1 has been the home of restaurants since the early sixties. In July of 2015 Klas Lindberg took over, and after extensive renovations lasting more than a year the doors were once again opened – this time to Portal. RESTAURANT. Here, the focus is on uncomplicated food with clear flavors and the best quality ingredients, and everything is designed to be paired with and heightened by great beverages. We offer a unified gastronomic experience. 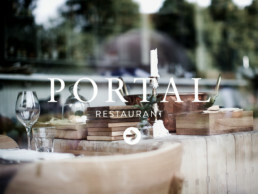 Portal is open monday to saturday and is suitable for every occasion, whether it’s an intimate dinner, large gathering, business lunch, spontaneous supper at the bar or just a glass of wine. BAR. Facing each other through large glass windows across the portal, bar and restaurant are connected, yet separate. 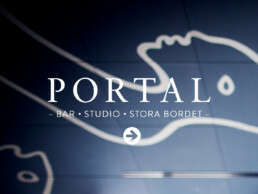 Portal Bar has a mischievous-younger-brother vibe. Let the dark blue walls, the huge ceiling fresco by Jesper Waldersten and the copper lamps frame the start or end of your night – or the entire evening. While dishes are doled out from the open kitchen, drinks are mixed and poured behind the grand bar. Choose between Nordic craft beer, drinks or nice wines. Here, the focus is on uncomplicated food with clear tastes and quality ingredients — alongside the belief that good food can be elevated effortlessly by great drink pairings. What we offer is a unified gastronomic experience.